Ukraine as of Friday, April 6, had sowed 138,000 hectares with grain and leguminous crops, or 6% of the forecast, the Ministry of Agrarian Policy and Food has said. 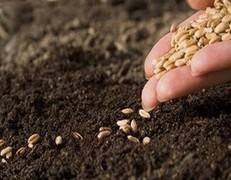 According to information on its website, spring grains are sown in 13 regions. In particular, spring wheat was planted on 2,000 hectares, or 1 percent of the plan, spring barley on 82,000 ha (5 percent), oats on 3,000 ha (1 percent), and peas on 51,000 ha (12 percent). Fertilization of winter crops for grain is continuing: nutrients have been used on an area of 4.5 million hectares (62 percent of the forecast). A survey of winter grains for the 2018 harvest shows that out from the seeded 7.3 million ha, seedlings were obtained on 99.7 percent of the areas, of which 6.4 million hectares (89 percent) are in a good and satisfactory state, while those on 816,500 hectares (11 percent) are weak and thick. Winter crops for grain for the harvest of 2018 have been sown on an area of 7.3 million hectares, or 101 percent of the area under the 2017 harvest. In particular, wheat was sown on 6.3 million hectares, or 103 percent of the target, barley on 800,000 hectares, or 94 percent, rye on 149,400 hectares, or 88 percent. In addition, winter rapeseeds for grain have been sown on an area of one million hectares or 112 percent.